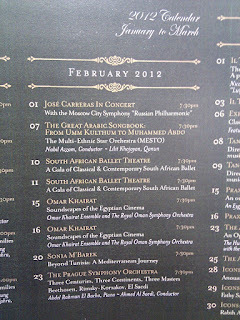 Today the Royal Opera House Muscat has announced the new dates for it's second season commencing from January 16th, 2012. 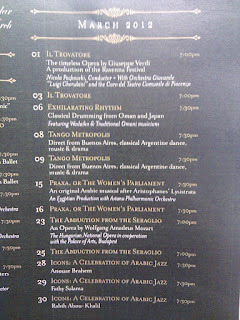 The new dates amount to 26 performances of 20 different types - a few performances run more than once. It has also been announced that there will be an additional encore month, April, which performances have not yet been finalized but will be announced once they have been. Tickets will go on sale on January 1st for group bookings (between 10 and 24 tickets) and January 4th for individual tickets. If you buy your tickets in a group, you can get a 15% discount. Now, for those concerned that large companies will just block-buy all the seats and prevent people from buying seats in smaller groups, well this has been accounted for and blocks of seating reserved for individual purchasers have been set aside. 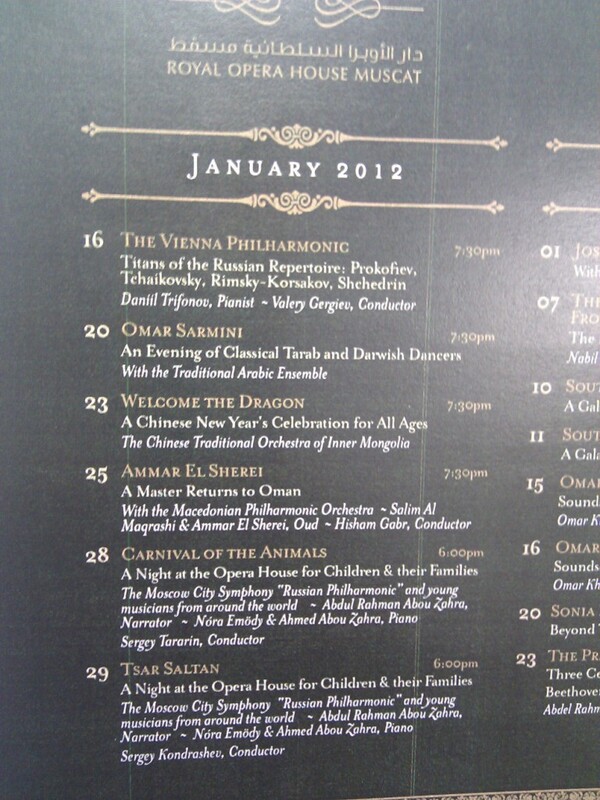 Interestingly, it seems that this second season has a stronger focus on education and accessibility - on the 28th January, there is the Carnival of the Animals, which has the Russian Philharmonic Orchestra, a large projection screen with live animation and is to be narrated in Arabic (with English subtitles). 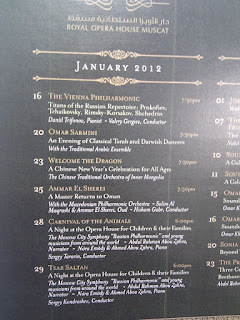 This is followed on the 29th January with the Tsar Saltan, in the same format. 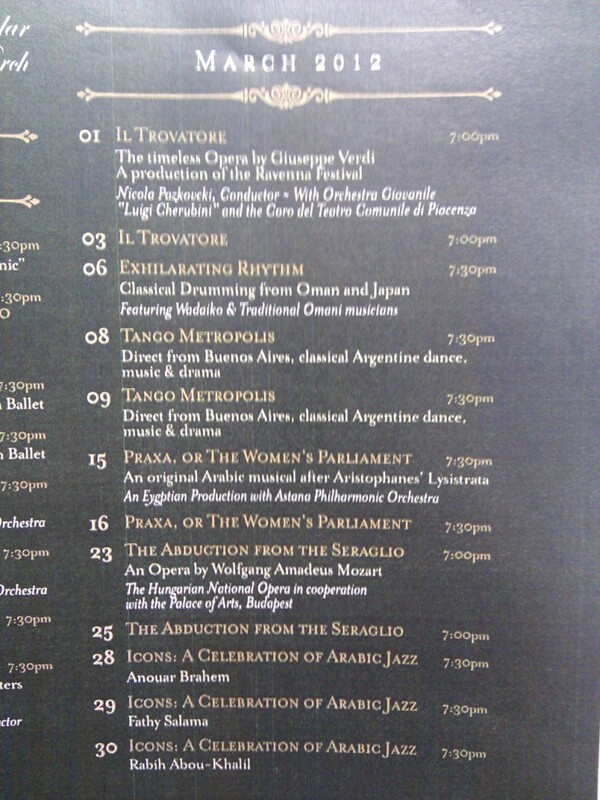 Tickets to these two events start at RO 3.000 per event, eg RO 3 per person per night. Both of these events are family and children orientated, and are being priced in a way that will hopefully allow access to more families that might otherwise have skipped going. There is also an initiative to start guided tours and back stage tours for school groups, and there is a planned open house on the first Thursday of each month starting in February, which I understand anyone can apply to go on. I can't help but wonder if this is in response to the Grand Mufti's outburst in November that Muslims should not go to the Opera House? heh. I overheard a comment that tickets to other events (other than the two family ones noted above) will start at RO 5.000 but I've not had that confirmed yet. Pricing will be released on the website in January, and yes I did ask a few times but they were all tight lipped. I imagine the premium seats will become more expensive, and the cheaper seats will become... cheaper? I guess it'll depend on the shows themselves. The Mall is touted to be opened in April, but we shall see. So there you go! What do you think about the new line up? 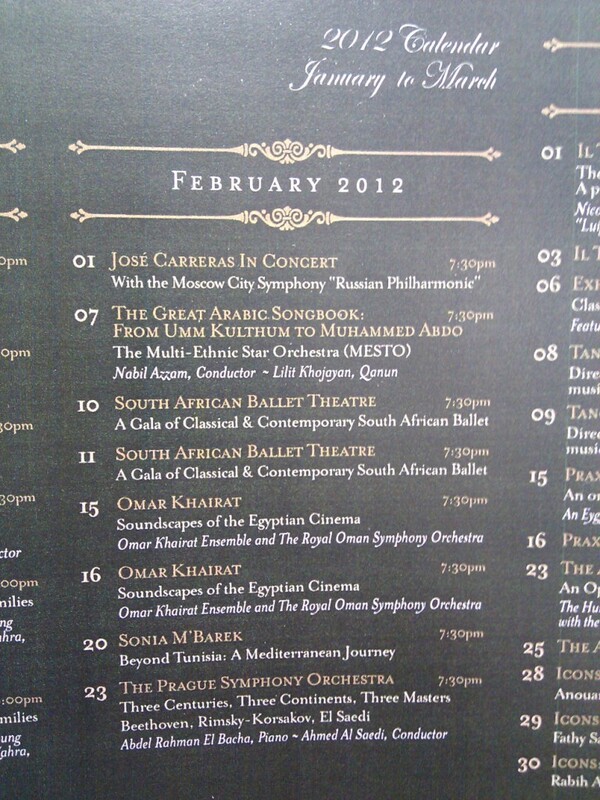 I've got 2 Swan Lake tickets for Thursday night (29th) available if anyone is interested. Please call me on 95328616 if you are interested. Actually, on the website if you click 'download calendar' it gives you all the pricing. There are no long sections 0-1-2-3. It's now by lettes (B-F). Cheapest 3, most expensive 55. I have 1 ticket available for 'Welcome the Dragon: Chinese New Year celebration for tmw's show (Mon 23 Jan). Good central seat level 0, zone B (45 rials purchase price). Call on 95203644 if interested.